Don't know whether to choose the new S3 or the older Galaxy S2? Check out our Galaxy S3 vs Galaxy S2 piece now. We've also got a full Hands on: Samsung Galaxy S3 review too. This Galaxy launch has certainly seen the tech press getting in somewhat of a fervour over Samsung's new handset - but we have to say that many of the core specs aren't a surprise. There have been too many strong rumours for too long. As you'll see, it's not an immense shift in specs from previous high-end Samsung handsets, but the screen sets a new standard for large, HD, smartphone displays. 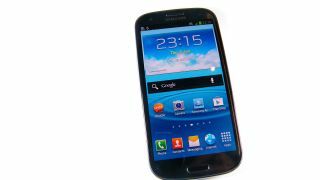 So let's take a complete, in depth look at everything we know about the new Samsung Galaxy S3 - the top-end handset from the company that is now the world's biggest smartphone maker. As you'd expect. the Galaxy S3 comes with Android 4.0 Ice Cream Sandwich by default - Android 4.0.4 to be precise. There's now a longer home button to go with the new OS. As you'd expect, you still get Samsung's TouchWiz overlay, albeit with a totally new and decluttered look. Samsung reckons it has been inspired by nature with this release (quite why, we're not sure) but as you can see here, there's plenty of water rippling around. As with HTC with Sense, TouchWiz is one of the key ways Samsung believes it can differentiate itself from other manufacturer's Android handsets. Samsung has also reworked the voice control on the Galaxy S3 - called Smart Voice. There's also something called Smart Alert which will vibrate when you pick up your phone to let you know you've got mail (or a text, or a call). The Samsung Galaxy S3 has the now-familiar Samsung app Hubs. The S3 introduces a new chip called the Exynos 4 Quad.The new 32nm 1.4GHz quad-core SoC is based on ARM's Cortex-A9 design. According to Samsung, there are performance improvements over the earlier Exynos processor - but that it consumes 20 per cent less power. The multitasking performance is demonstrated by a feature called Pop Up Play, that enables you to carry on doing tasks in a corner of the screen while watching a video at the same time. "The quad-core processor offers phenomenal multitasking abilities surpassing any single or dual application processor. Since all the cores must share a single battery, the power management and efficiency in the limited battery capacity are indispensable for mobile computing devices," said Taehoon Kim, head of Device Solutions, Samsung Electronics. "Given the diverse functionalities consumers are demanding from their mobile devices today, the Exynos 4 Quad meets those high-performance needs while keeping power consumption very low." The Galaxy S3 takes Super AMOLED to a new level with a 4.8-inch HD 1,280 x 720 screen that makes an iPhone's retina display look tiny. It's half an inch bigger than the previous S2's 4.3-inch, 800 x 480 screen and has to be seen to be believed - the colours are superb. The S3 comes in 16, 32 and 64GB versions - the latter will impress those who have been waiting for a high-capacity Android handset. Both feature 1GB of RAM. There's also a microSD slot in the side of both. Like HTC, Samsung has partnered with Dropbox - you get 50GB to store your stuff. The Samsung Galaxy S3 boasts an 8 Megapixel camera with autofocus, LED flash, geo-tagging, touch focus functionality, face/smile detection, image stabilisation and 1080p video capture. That isn't a huge advance on earlier handsets though and we'd expect Samsung will get some user criticism over it. The front camera is a 1.2MP 720p unit. Samsung reckons you'll get great low light shots from the main camera, while there's also been a real boost to the speed of taking an image - you can take three per second in manual mode or six per second in burst mode. As you'd expect, the S3 is capable of full 1080p HD video playback. As you'd expect, the S3 incorporates 3G/HSDPA and HSPA+ at speeds up to 21Mbps where supported. It's got every band of Wi-Fi covered too and can handle 802.11a/b/g/n with DLNA content sharing and Wi-Fi Direct. You also get the new and more power efficient Bluetooth 4.0. The S3 can also use MHL to output to a monitor via its micro USB port. The S3 features GPS/A-GPS, a built-in gyroscope, digital compass, plus screen-flipping accelerometer, proximity as well as a barometer. Like the Galaxy S2, the new S3 is a neatly designed, beautiful-looking handset that measures 136.6 x 70.6 x 8.6mm compared to the S2's 125.3 x 66.1 x 8.49mm. Yes, note the size has gone up across all the dimensions. The S3 weighs in at a respectable 133g compared to the S2's 116g which, if you've held one, you'll have thought was very light indeed. Like the S2, the S3 continues with a lightweight plastic design and, while it won't appeal to all, it's only 7g lighter than the iPhone 4S. It's a lot curvier than the S2, more like the Galaxy Nexus.